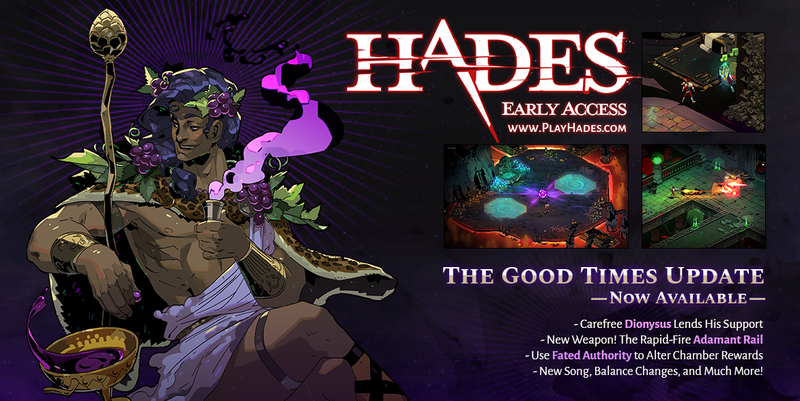 - Meet Dionysus, God of Wine, a carefree meddler who’s always up for some feasting! With his blessings, your foes are really going to feel it in the morning. - Wield the ‘Adamant Rail’, a rapid-fire weapon that predates (and out-classes) early firearms by several millennia! It packs a real punch with its own distinct playstyle. - Unlock the Power of ‘Fated Authority', with which you can bend the Underworld more to your will. Use it to tempt the Fates to yield alternate rewards in each chamber! - Descend into ‘Infernal Gates', if you dare! Grow stronger than ever, but only if you can complete tough challenges intended for experienced players. Plus, look for new abilities, balance changes, fully-voiced narrative events, enhanced art and visual FX, a brand new song from our award-winning composer, and many more features and improvements! Full patch notes are available in the game client and our official Discord. The Good Times Update also introduces our new Development Roadmap, accessible from the game’s main menu. It describes our priorities around creating a new Biome packed with new foes and challenges, new boss fights, and new ways to take advantage of the various resources you accumulate as you play, as part of our development goals for this year. Our Roadmap should shed some light onto where we think the game is headed -- without spoiling any of the surprises we have in store! Until then, we hope you have a smashing good time with our latest update, and we’re excited to hear what you think!